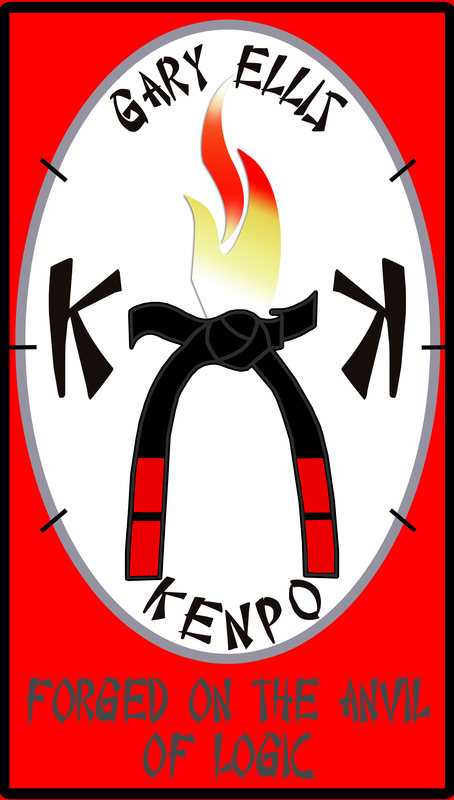 This crest was designed by Gary Ellis and depicts a burning 10th Degree Black Belt within a stretched circle (oval) and a stretched square (rectangle). 10th DEGREE BLACK BELT - represents the Founder of American Kenpo Karate Senior Grand Master Ed Parker. THE FLAME - represents the Art and is an eternal Flame which still burns on. The three tips of the flame represent the 3 stages of learning, PRIMATIVE, MECHANICAL and SPONTANEOUS. The colours show progression through the BELT RANKS. STRETCHED CIRCLE AND SQUARE - represents ELONGATING CIRCLES and ROUNDING OFF THE CORNERS. BLACK BORDER - The BLACK BORDER represents GARY ELLIS FAMILY TREE BLACK BELTS who keep the flame alive. WHITE BACKGROUND - Represents the WHITE BELT OR BEGINNER LEVEL a door we must all pass through on our Kenpo Journey. GREY BORDER - represents the GREY MATTER OF THE BRAIN showing our Art to be a "Thinking Person's Art"
DIVIDING LINES - on the GREY OVAL BORDER represent the 8 ANGLES OF ATTACK and allude to the 18 HANDS OF LOHAN a reference to the origins of our Art DAMO and the SHAOLIN TEMPLE. FORGED ON THE ANVIL OF LOGIC - Firts part of our MOTTO and it represents the "IRON WORKING" (THE TIGER) ,that is required to "MASTER" the Art. The second part of our MOTTO which is not shown is TEMPERED WITHIN THE POOL OF WISDOM a reference to "HIGHER KNOWLEDGE OF THE DRAGON"